Land art installation and community engagement (Earth, cinder block, para-cord, pvc spheres, helium). Installation view, US/Mexico Border, Douglas, Arizona / Agua Prieta, Sonora. 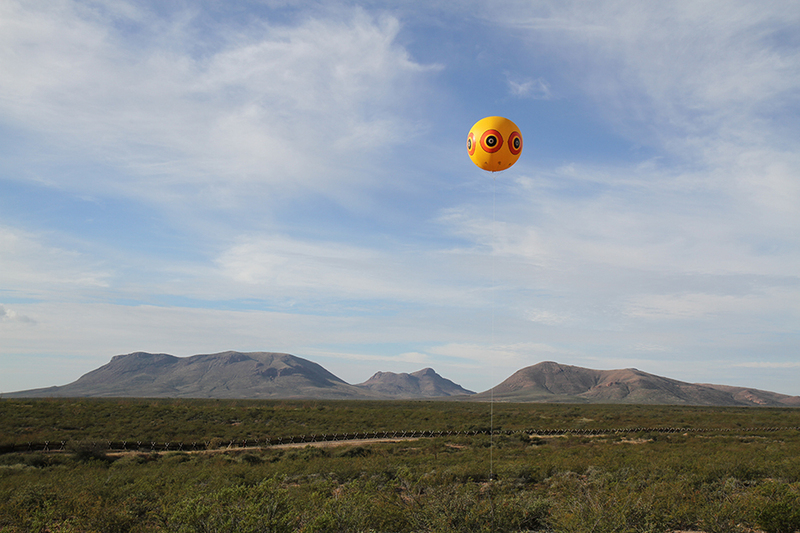 The Repellent Fence is a social collaborative project among individuals, communities, institutional organizations, publics, and sovereigns that culminate with the establishment of a large-scale temporary monument located near Douglas, Arizona and Agua Prieta, Sonora. This 2 mile long ephemeral land-art installation is comprised of 26 tethered balloons, that are each 10 feet in diameter, and float 100 feet above the desert landscape. The balloons that comprise Repellent Fence are enlarged replicas of an ineffective bird repellent product. Coincidently, these balloons use indigenous medicine colors and iconography -- the same graphic used by indigenous peoples from South America to Canada for thousands of years. The purpose of this monument is to bi-directionally reach across the U.S./Mexico border as a suture that stitches the peoples of the Americas together—symbolically demonstrating the interconnectedness of the Western Hemisphere by recognizing the land, indigenous peoples, history, relationships, movement and communication. Critiquing the oversimplified border rhetoric of mass media and bi-partisan politics, Repellent Fence and its corresponding events include the participation of borderlands stakeholders, across diversity and interests, in generative conversations -- as a means of broadcasting complex approximations about the complexity of movement (peoples, cultures, ideologies and capital) of U.S./Mexico transborder systems. In other words, the intention of Repellent Fence is to organize a network of dialogues between indigenous, United States, and Mexican publics and their government agencies. The intentions for these generative dialogues are to form local and external capacities for the recovery of transborder knowledges that have been arrested through binary discourses. The benefit of these narratives are to identify and support indigenous and border community interests, desires, concerns, and goals for creating a more safe, healthy, and culturally appropriate borderlands environment for its citizens. In addition to broader stakeholder implications, the intention of the Repellent Fence is to dialogue with the complex realities of the border experiences of indigenous peoples, which includes those who are geographically divided by the United States/Mexico border by examining the regional to global implications of political agendas and economic policies between neighboring sovereigns (the United States and Mexico). The goal is to shift transborder discourses away from dehumanizing and polarizing constructs of nationalism and globalization, and to reposition discourses into a dialogue that is respectful of the indigeneity upon which borders and trade policies have been fabricated. The goal is to use the borderlands as a metaphor to acknowledge and honor the Indigenous peoples of the Western Hemisphere – both those who are experiencing diaspora, and those who are coping with the militarization of their ancestral homelands. Left Image: artist study of balloon installed near the border fence. 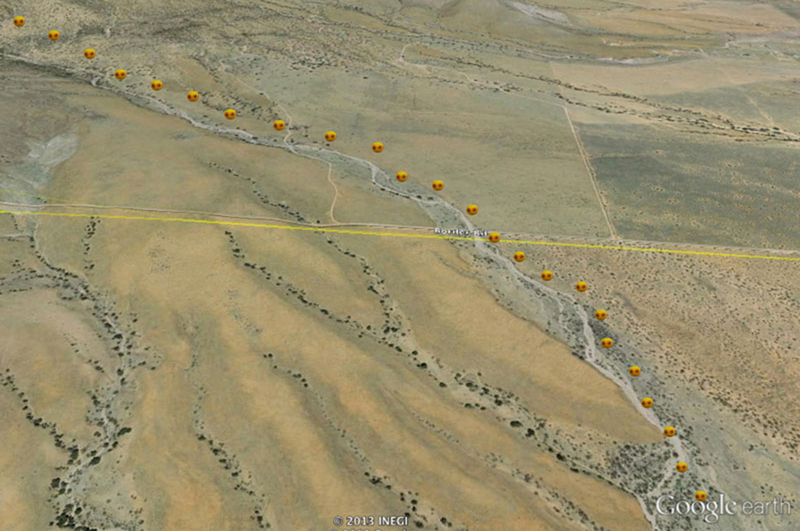 Right Image: Google map artist sketch of Repellent Fence intersecting border. 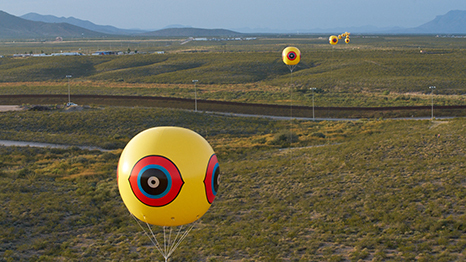 Repellent Fence recognizes all indigenous peoples that are intermeshed in the theater of the contemporary immigration crisis of the Americas – here we (Postcommodity) refer to the historical stewards of the land, and those who are following ancient indigenous trade routes in search of economic opportunity. 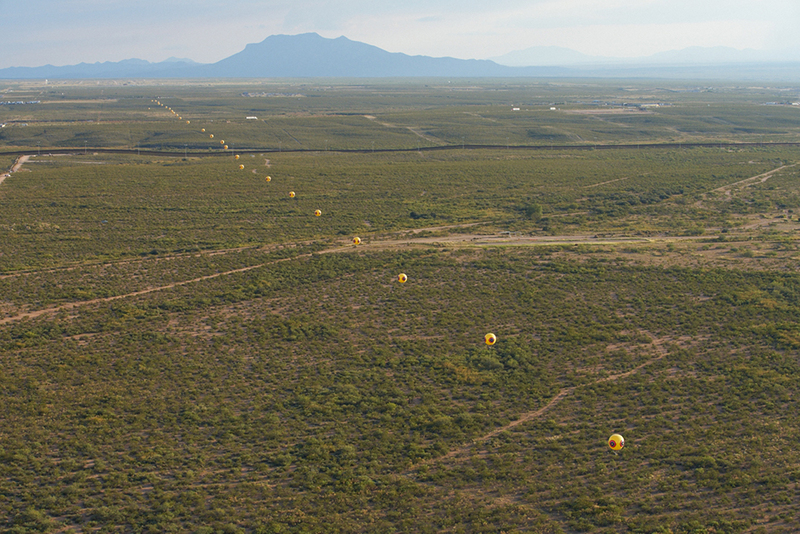 Repellent Fence is made possible with the efforts of our community collaborators in Douglas, Arizona and Agua Prieta, Sonora. Our partners include the city administrations of Douglas, Arizona and Agua Prieta, Sonora, the Mexican Consulate in Douglas, La Casa de la Cultura in Agua Prieta, and Fronteras de Cristo. We would personally like to thank the following community leaders for supporting bi-national dialogues, diplomacy, and cooperation: Cónsul de México en Douglas, Jorge Ernesto Espejel Montes; Mayor of Douglas, Danny Ortega Jr.; Mayor of Agua Prieta, Héctor Rubalcava; the city administrations of Douglas and Agua Prieta with a special thanks to Douglas City planner, Carlos De La Torre, and Agua Prieta City Adimistrators, Laura Ríos and Lucero Salazar; Assistente del Cónsul Titular Consulado de México en Douglas, Cristóbal Lohr Castelo; Agua Prieta Architect ,Roberto Osuna Palacios; Mark Adams from Frontera de Cristo; and Douglas / Agua Prieta artists and arts advocates Jenea Sanchez, Roberto Uribe, Martína Rendón, and Enrique Barraza. 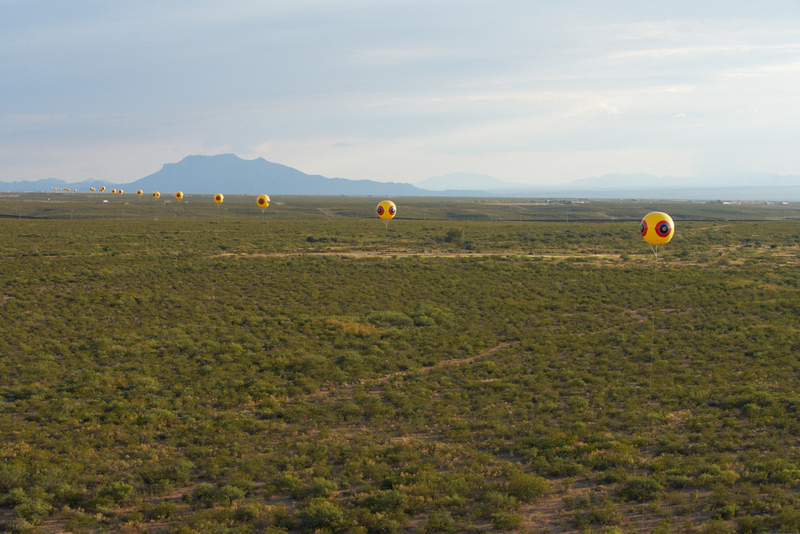 Repellent Fence is presented in collaboration with Arizona State University Art Museum and supported by grants from Creative Capital,	Native Arts and Cultures Foundation, Joan Mitchell Foundation and Art Matters.